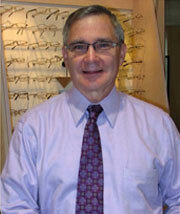 Dr. Ronald Nelson is a 1973 graduate of The Ohio State University College of Optometry. After graduation he became a commissioned officer in the United States Navy until his retirement in 1994. He has been in private practice since that time. Dr. Nelson is a member of the American Optometric Association and the Ohio Optometric Association. Dr. Nelson enjoys following the Buckeyes and spending time with family. Dr. Nelson is in Green on Wednesdays, and in Fairlawn on Saturdays.